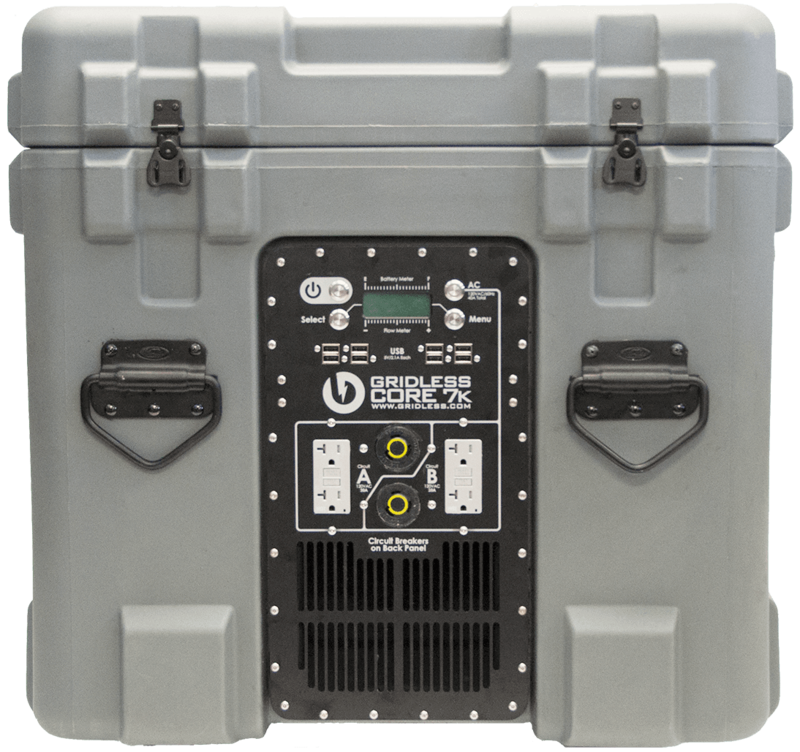 Powering a Concert Using Only Batteries - Gridless Power Off-grid, clean, rugged solutions for your toughest power problems. Gridless designs solar batteries with the capacity of a generator. If there is one thing that ruins a good event or concert it is a noisy generator. It is not just that they are loud, but they also require extensive permits, produce nasty fumes, and create “dirty” power. Up until now, they have been the only solution for portable event power. 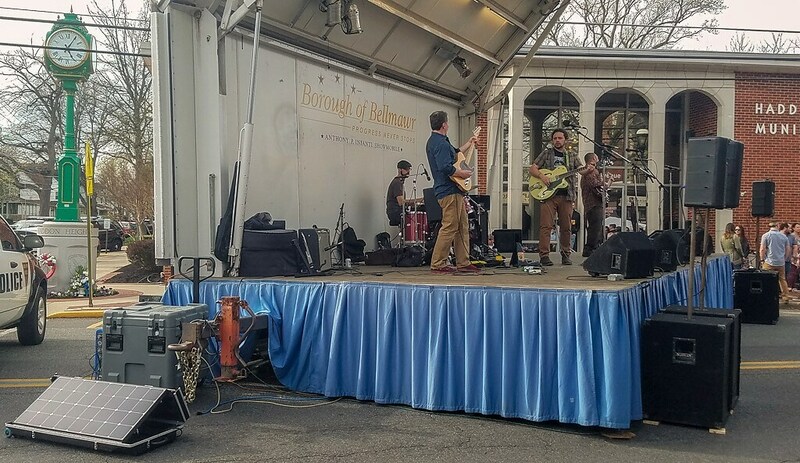 To show how we stack up against generator power, we decided to power a stage at the Rhythm and Brews Festival in Haddon Heights, NJ using only 2 Gridless 7000 units. There were 6 bands scheduled to play 45-minute sets. Each band had between 4 and 6 people with most groups consisting of two guitar players, a bassist, a drummer, and an occasional keyboard player. All of the amps were cranked to about half volume and then mic’d up to the PA. The live sound setup consisted of 5 power amps powering 8 front of house PAs and 6 monitors facing back at the musicians. In order to get an accurate reading of how much electricity each piece of gear was consuming from the battery, we placed a small sensor in between each piece of gear being powered and the battery. We measured kilowatt hours used after each set. We set up a microphone under the stage to record the concert, so we could get accurate start and end times for the sets. One of the big concerns with running audio equipment off of batteries is that audio equipment often has a very high wattage rating. The reason it can work is that equipment rarely, if ever, draws it’s rated power. For example, a 3,000 Watt power amplifier rarely reaches 3,000 Watts in surge situations and is only that powerful in order to guarantee clean headroom for your PA speakers. Our setup at the show had 16,200 Watts of rated amplifier power. Yet, the highest non-surge reading we captured was 2,000 Watts. So what did we end up powering? 2 Gridless 7000 units powered all of that gear for the entire 6 hour show, with plenty of battery to spare. We took the concert recording and threw it into our DAW Reaper to mark when musicians were actually playing. We determined that musicians were playing only when the track was clipping and that the remaining time was sound check and filler music. The whole recording was 6 hours and 39 minutes long, however, once we broke it down into its various parts you can see that live music was not played the whole time. This means that the actual performance was only being amplified 65.41% percent of the time. We took the audio data and matched it up to the measurements from our sensors in the following spreadsheet. The average 5 person band draws an average of 275 Watts at stage volume. In isolation, the Gridless 7000 could power that for an entire 24 hour day, and our smaller Gridless 1250 could power a 4 hour concert. The guitar pedal boards barely even pulled any power. In fact, during most sets, they drew so little power that the sensors use of increments of 0.01 kWh was too large for detailed reporting. The live sound setup draws an average of 700 Watts at performance volume. This was the primary drain on the system because it had to project the music all the way to the back of the festival. However, our Gridless 7000 was up to the task and in isolation could have powered it for 10 hours. As you can see from the chart below, a full concert does not draw anywhere near the power levels we were expecting. In total, the event used 6.43 kWh of energy which means, the concert could have run the whole stage off of a single Gridless 7000. To understand why a small 7,000 watt battery could outshine the 20,000 watt generator that was scheduled to be there, we have to take a look at how batteries work. How Can a Small Battery System Compete With a 20kW Generator? During the Rhythm and Brews Festival, our average power draw was around 1,000 Watts. However, that is not a continuous 1,000 Watts because audio equipment power usage has dramatic peaks and valleys. Therefore, to be ready for a 20kW spike in power needs, you need to have a 20kW generator. Generators hate variable power draw… Batteries love it. Because batteries discharge power at a wide range of levels on command, you can use a battery that has a low inverter output and a high surge rating. 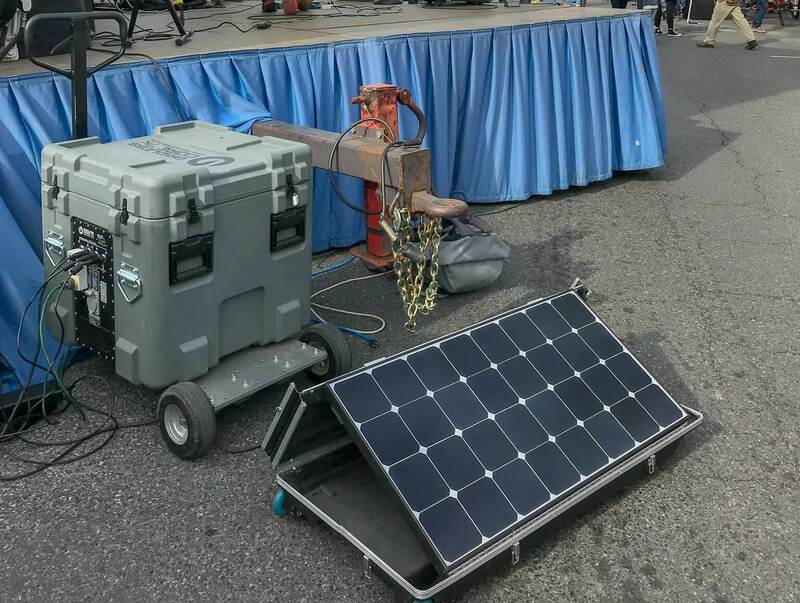 In this case, we had 2 Gridless 7000 units at the event with a 7kWh capacity, a 5kW inverter, and 10kW surge. Therefore, their maximum combined power output would be 10kW with 20kW of surge allowing them to deliver as much power as 20kW generator for a short period of time. This is a bit confusing, so take a look at the following graph of a hypothetical concert situation to get a better understanding of what is happening here. The red line represents a traditional 20kW generator outputting a continuous 20kW in order to be ready for spikes in load. The blue line is the battery system’s output. If you notice the battery system hovers around the average 1kW and fluctuates with the load. The the area between the two lines is all of the power saved. This efficiency is what allows a small capacity battery to replace a much larger generator. The concern we always hear is how long will our system last? This goes back to the graph above. Music is not played at maximum volume at every frequency. In fact, music is very dynamic as shown by the blue line. Therefore, testing a battery’s performance with everything cranked to 11 is an ineffective way to measure its capacity in a concert situation. If you do want to know, what a battery can power then get in contact with us here and we will work with you to configure the ideal setup. No matter the use, generators are ideal power sources situations where power draw is high and steady. Halogen stage lighting for example consumes power this way and can push a concert to requiring a large generator. Battery systems on the other hand are great at powering peaky power draws. In most small to medium sized stages, Gridless technology can replace a much larger generator and deliver clean, quiet, power while saving money on permitting and logistics. Organizing an event and want to ditch your generator? Get in contact with us below.